So we finnally had our 20 week scan! where is this pregnancy going! before I know it the baby will be here I will be a mum of three, suddenly not so care free anymore! We both was thinking another girl, that would be good we have tons of clothes ready Ami will have a little sister. A little boy with olive skin and dark hair like his dad football mad like his brother, I was not fussed could swing either way! Last year we were only having Amis 20 week scan where they scared us telling us they saw a shadow on her heart and we had to go to St Thomas's but thank god everything was ok! So they started the scan showing us everything, feet hands, baby yawning, all so cute! The scan ended and we asked the question boy or girl? 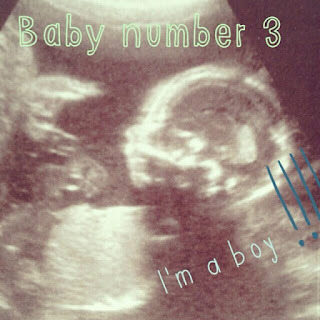 ..... and we are having a little boy! I nearly cried really didnt expect it at all! There was a stunned silence between me and my husband! He was so sure another little princess but now another Arsenal fan! me and Ami now outnumbered were never going to watch the girly films! But im also so so pleased! next time i see my little boy he will be in my arms! i will be a mum of three... making me feel like a proper grown up! My mum tried to persuade me not to find out, but i couldnt not I find it really helps me bond with my baby, thinking about him, getting stuff ready! I didnt want to find out when i had pants but his dad needed to know then told me an hour after the scan, Thanks! With Ami me and my husband wanted to know so we could prepare, the great thing about being in a church people are always happy to give you stuff! Now I cant wait he is going to be one handsome little chap hurry up 20 weeks! Congratulation! A boy! We did not find out for my first child (which was a girl) but for my second we really wanted to know and I was thrilled to find out it as a boy. Boys are so sweet. Loved stopping by your blog and look forward to following your journey. Thanks, yes boys are sweet also smelly lol! my husband said i breed crazy boys but I think all children in general! lol! What lovely news, and so glad you shared it on #PoCoLo! Thanks for linking! wow!! i am so pleased all is well and now you can shop! !